Different economies, included Japan, reported soft Q4 growth. US December Retail Sales expected to have risen modestly. The greenback continues advancing against its major rivals, baked by hopes that the US government would avoid another partial shutdown and would extend trade negotiations with China beyond the deadline set for March 1 if it´s needed, and trouble in the Old Continent. The USD/JPY pair hit 111.12 during Asian trading hours, now consolidating around the 111.00 figure, as the market is in wait-and-see mode, ahead of US December Retail Sales and January PPI figures. Data coming from Europe was mixed, as German growth stalled in the last quarter of 2018, as the preliminary Q4 GDP came in at 0.0%, while for the Union, the estimate was as expected, 0.2% for the same period. Japan released overnight its preliminary estimates for Q4 GDP, up in the three months to December by 0.3%, worse than the 0.4% expected but better than the previous -0.6%. Economic growth compared to a year earlier resulted at 1.4%, matching previsions. The pair is nearing a major resistance area, the 111.40 region, where it has December 26 high and in the daily chart, the 100 DMA. 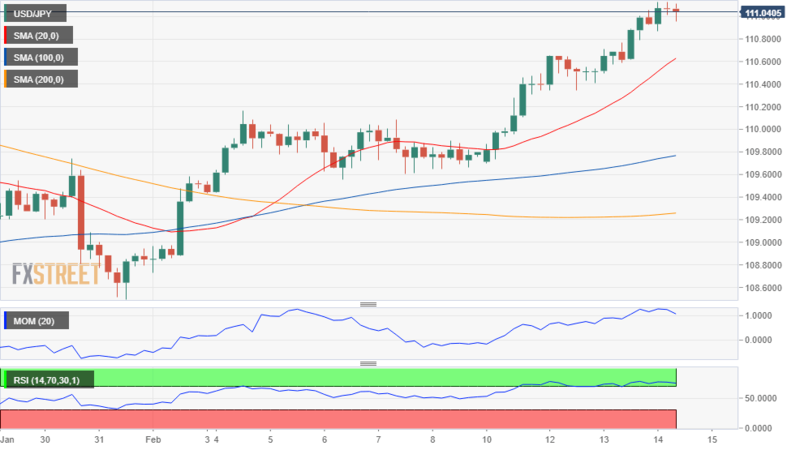 In the 4 hours chart, the pair remains well above its moving averages, with the 100 SMA gaining upward traction over 100 pips below the current level. Technical indicators, however, lack upward strength, the Momentum nearing its mid-line and the RSI easing within overbought levels. Modest signs of upward exhaustion yet to be confirmed. The pair could turn south short-term if its decline extends below the daily low of 110.86, although the bearish case will come back to play only if the slide extends below 110.10. Selling interest will likely reject the first test of the 111.45 area.